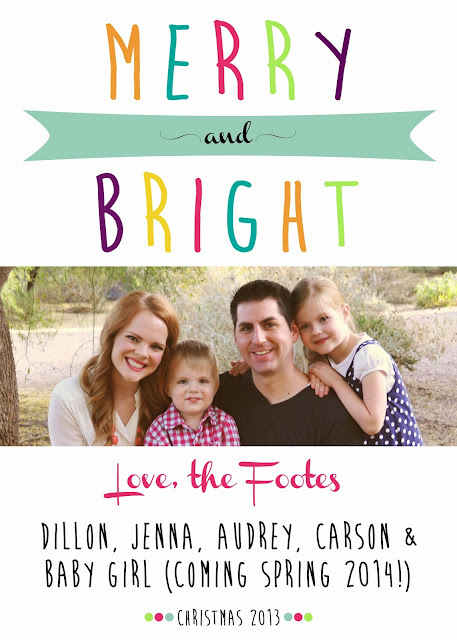 Mom, the Intern: A Foote family Christmas card. A Foote family Christmas card. We only send hard copies of our Christmas card -- IF I decide to make one -- to close family members (parents, grandparents and siblings). It's because we're cheap, remember? So the rest of you will have to enjoy a digital copy. Look on the bright side -- at least you won't have to feel badly about throwing it away in a few weeks. Wishing you all a very happy Christmas and a blessed new year. I dont throw mine out. I keep them in a folder to see how the families change from year to year. But its all good. :) Your family is so cute! Do you have a name for the little miss yet? She and my baby boy can be BFFs. No names yet! I think we'll get started on that after Christmas. Love the card. :) The picture is adorable. By the way, stop by my blog this week. I'm giving away a gorgeous scarf courtesy of Fresh Produce! What?! We would never throw your card away! We'd use our shredder. Well that's good Aunt Saroon. At least my identity would be safe! Haha. I love love love the design. So cute!